I was going to skip this month once I saw the preview, but decided in the interests of my investigations to see whether last months service was a one off or whether it was consistent. The choice of items wasn’t as good as last month, and is entitled Cult Beauty, with products from the latest brands. 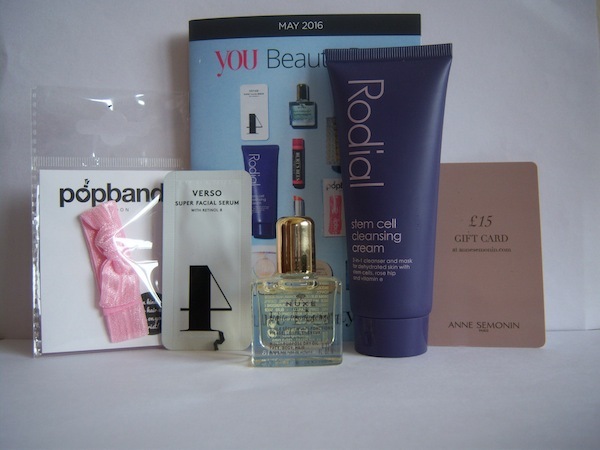 The bonus sample products this month includes: Popband hair tie (worth £2.60), a sachet of Verso Super Facial Serum (1 ml, worth £3), and an Anne Semonin £15 gift card (with no minimum spend). The SHOW Beauty Pure Treatment Oil for the hair sold out within a couple of days, followed by the MUA Prime & Conceal Palette, but I chose safe products that I know I will use. Don’t be fooled by the name of the Rodial Stem Cell Cleansing Cream as it doubles up as a cleansing and hydrating mask, which I use it as. I opted for the classic NUXE Huile Prodigieuse multitasking oil (hair, body and face), mainly because I didn’t need any of the other products, and I prefer to buy my own lip colored items. They were safe choices, because while there are many swap clubs and groups, I still would rather have products I actually need or will use. This month the dispatch note arrived after my box, but it was still speedy. I ordered on the first day of May and it arrived within five working days. The box hasn’t got any new products, but a small selection of classics, however, is still good value. Don’t forget as as subscriber you get free postage on limited edition boxes (£4.95) so it can be worth keeping the subscription for that alone. I like having the control over what I choose and if I want a box, and You Beauty Box allows both, so you should never end up with products you don’t want. As usual, there are some negotiated discounts; 20% off at www.muastore.co.uk until 30/06/16 with YBBMUA, and 15% Nuxe with YYB15 at www.nuxe.co.uk until 01/07/16. Rating 3/5 as an average box, for value, choice of products, and speed of delivery.